Amid the increasing – and justifiable – existential angst towards the longevity of the Euro, the hoary issue of the Target 2 imbalances within the Eurosystem has resurfaced as an analytical and investment theme. Some argue that the size of potential Target 2 financial liabilities accruing to a particular country is a reason for government’s remaining committed to keeping the Euro intact. Others argue that the widening imbalances are driving a growing political opposition to the current levels of financial integration in Europe. In reality, these arguments lend the issue of Target 2 imbalances far more importance than it deserves. 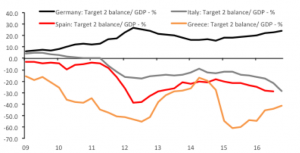 Compared to other challenges facing the Eurozone, Target 2 is a very tractable problem. Of far greater concern in the event of a Euro break-up would be the destabilising FX volatility and the legal issue of currency redenomination. Target 2 need only be a major issue in the event of a break-up of the Euro and a risk to real economies if governments choose to make it so. The hoary issue of the Target 2 imbalances in the Eurozone has re-emerged as an analytical and investment theme. It motivates conflicting arguments. Some state that the surge in public sector indebness in certain countries should a Euro break-up crystalise Target 2 imbalances as a loss, reinforces the need for governments in the Eurozone to ensure that the currency remains in tact. Others argue that governments will increasingly seek to reduce the level of Target 2 imbalances and thus reduce this potential liability, which can only be acheived via a reduced level of financial and economic integration within the Eurozone. What is clear to us is that both of these arguments imply a greater significance to Target 2 imbalances than economic rationality implies. In essense, Target 2 would only have major real economy consequences in the event of a Euro break-up should governments choose to allow it to do so. Target 2 – replacing the role of changing FX reserve and exchange rates. It is first worth defining what Target 2 is. It is simply the means by which financial transactions are settled across borders within the Eurozone. National central banks (NCBs) are the intermediaries for cross border flows and transactions and do so via the ECB’s balance sheet. 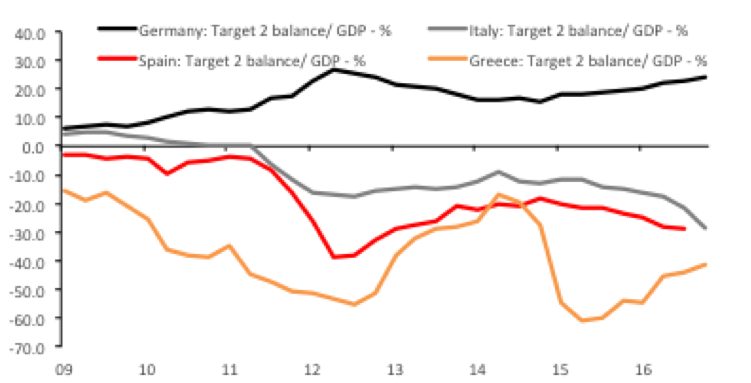 In this respect, Target 2 imbalances are a reflection of the balance of payments trends within the Eurozone. Countries that are net exporters of capital have Target 2 surpluses and vice versa. Were the Eurozone merely a collection of fixed exchange rates, instead of Target 2 imbalances FX reserve accumulation and depletion by NCBs would be the equilibrating factor. Similarly, were the region to have floating exchange rates, FX movements would replace Target 2 imbalances. One consequence of Target 2 is that it removes traditonal self-equilibriating factors that can otherwise help to address imbalances between countries. If a country is a large net capital exporter or has a large trade surprus, were we in a regime of floating exchange rates, one might assume that over time it’s currency would appreciate and winnow away some of it’s external competitivness. Similarly, were we in a regime of fixed exchange rates, instead of swings in Target 2 imbalances FX reserves would adjust. This could lead to concerns about the longevity of continued, large-scale FX reserve accumulation or depletion, in the former case due to concerns about the capacity for cental banks to sterilise the associated domestic monetary impact. This can lead to decisions to end FX intervention and allow a currency to adjust (the decision of the SNB to break it’s EUR/CHF peg In January 2015 was an example of the latter point) or it can lead to excessively loose monetary policy creating economic overheating and inflation, or vice versa. Target 2 avoids these outcomes and allows economic imbalances within the Eurozone to persist. The greatest consternation regarding these imbalances naturally comes from the surplus countries. In the event of a Euro break-up and the dissolution of the Eurosystem and the ECB, there is concern that these liabilities might be defaulted upon, which would create a pronounced hit to the fiscal position of governments in countries such as Germany, Holland and Finland. This concern is driving the increased rhetoric about Target 2 being the critical fragility at the heart of the Euro. However, much of this analysis ignores the fact that the liabilities and assets are held by central banks, which have in theory unbounded balance sheets. That makes a crucial distinction as central banks are institutions which, depending on their governing rules, can easily absorb losses without there being a notable impact on the real economy. Indeed, we characterised the early phase of the Euro sovereign crisis as being a search for a balance sheet. The crisis only abated when Draghi replaced Trichet as ECB President and deployed the ECB’s balance sheet, the only one large enough to suppress credit and liquidity risk premia in the Eurozone. 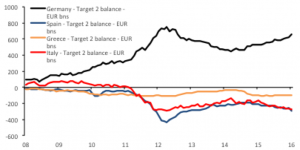 A default on Target 2 imbalances would show up as a loss at the ECB. The ECB would try to cover the loss with it’s accumulated reserves and given that this would be unlikely to bridge the gap, could ask NCBs to boost it’s capital. The ECB rules states that if they were unable to do so the losses would be placed on the ECB balance sheet and offset by future profits. i.e., the ECB would operate with negative capital for the foreseeable future. The only real economic risk of a central bank having a negative capital base would be if the institutions deployed inappropriate monetary policy settings to try to create profits and rebuild capital, such as expanding money supply and generating income by riding the curve. That would be an unlikely outcome given that the political cost of doing so could be greater than the cost of maintaining a negative capital base, and in an environment of aggressive ECB QE would hardly be a compelling concern. Of course, the ECB may not exist in the event of a full Euro break-up, in which case all of the imbalances would fall to NCBs. The situation would be the same however. In the case of Germany, Buba would have a pronounced capital deficit. The accumulated Buba profits from 1985-2015 were EUR148bn, less than 20% of the current value of Germany’s Target 2 assets. Moreover, the latest Buba annual report revealed that it’s risk management buffer fund measured just EUR13.8bn. However, it could offset that liability against future revenue and not force the government into providing a recapitalisation. The Buba articles of incorporation require that profits be transferred to the government after statutory reserves have reached EUR2.5bn, but does not specify the need for a government recapitalisation in the event of a loss. The argument that “the Euro is vulnerable because of Target 2 imbalances” is a close relative of the oft-heard emerging market argument that “FX translation effects on FX reserve holdings mean that central banks cannot allow their currencies to strengthen as this will create a central bank capital shortfall”. It is a problem only to the extent that governments and central banks make it a problem by demanding that capital losses be plugged via fiscal funds. It is unlikely that such a self-inflicted dose of fiscal profligacy would be at the top of the economic agenda of governments in the event that the Euro broke-apart. Were the Euro to break, central banks, governments and the market would have far larger concerns than Target 2 imbalances. The end of the Euro and the Target 2 settlement system would mean that balance of payments flows would be adjusted via FX movements or FX reserve depletion/ accretion. Given the scale of potential capital flows, in particular as capital exporting countries withdrew their funds to the domestic market due to home currentcy bias at a time of crisis, there would need to be some pronounced FX reserve changes or, more likely, FX movements. The return of the DEM, for instance, would naturally be associated with a pronounced appreciation, which would have consequential effects on the German business cycle. A particularly intractable problem that would accrue were the Euro to break would be the associated legal implications. What currency would the assets or liabilities of financial institutions be denominated in? Would they revert to the new national currencies, would they remain in Euros or be referenced to a European basket? The legal determination could markedly influence the solvency of financial systems across Europe, given that more liabilities (deposits) may be transferred to a local currency than assets (non-domestic EUR or foreign currency asset holdings.) The legal implication of a Euro break-up could have the potential to dwarf the uncertainty that prevailed in the days following Lehman’s collapse, when financial institutions struggled to determine what their positions and risk exposures actually were. Of course, an economic analysis of why the problem of Target 2 imbalances could be overcome with reference to a central bank balance sheets need not penetrate the often-impenetrable wall of political bluster. Target 2 remains a heated political issue within the Eurozone. In these times of high-populism/ low-factual based analysis, one cannot rule out the rising Target 2 imbalances prompting a political backlash in a creditor country against the current level of financial integration in Europe. However, this appears unlikely. One would hope that the voice of technocrats tends to be louder and gain greater resonance the more technical a topic is. (Although we have to admit that this did not prove true of Brexit.) Were policy to be influenced by the widenign Target 2 imbalances, we would anticipate the ECB to stress the limitatiosn of this argument. In short, don’t succumb to the Target 2 head fake. Reserve such concerns for far greater European and global market implications of any Euro break-up. This entry was posted in Event Risks and Left Tail Events by Des Supple. Bookmark the permalink.